Volunteer Ted Leigh demonstrates how the 1886 Columbian Press was used to print newspapers. HAVERHILL — You might want to mind your p’s and q’s on a visit to the Museum of Printing. No, there’s no particular code of conduct, beyond the usual decorum of museum-going. Rather, according to Friends of the Museum treasurer Ted Leigh, it’s a reference to one possible origin of the expression: In typesetting, printers historically had to be careful to heed the difference between the p’s and the q’s, which are mirror images. The staff is meticulous about archiving the history of printing, and they’ve only grown more so since moving to this new permanent location last fall. After the museum spent more than a decade in leased space in North Andover, Frank Romano, its major driver and “professor emeritus,” found and purchased an old electrical supply shop in a residential neighborhood just off Interstate 495. During the move, which involved more than 50 tons of equipment and materials and about 7,000 books from Romano’s personal collection, the museum’s volunteers — no one gets paid — identified duplicates of scores of rare and unusual books. On April 1, the museum will host a book sale that will double as another housewarming for its new location. “I’m a hoarder,” said Romano. Besides hosting one of the largest collections of printing-related artifacts in the world — from letterpresses and linotype machines to various bookbinding tools, typewriters, and primitive computers — the museum features two libraries: a conference room dedicated to typographic reference works and the Romano Book Arts Library, a reading room with custom-built, floor-to-ceiling mahogany bookcases filled with Romano’s huge collection of books about printing. 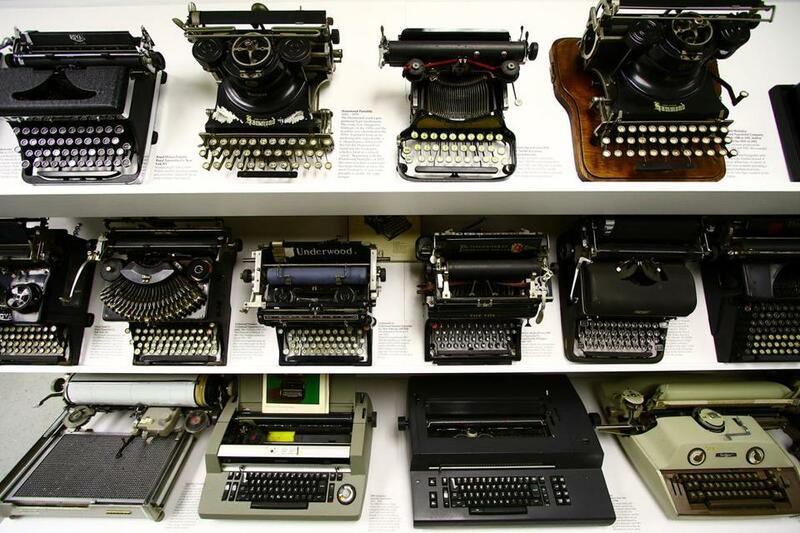 The museum’s collection of vintage typewriters. He has written about 60 of them himself. Though he says he has spent as much as $40,000 of his own money on a single rare volume, Romano said the museum operates only by donation. 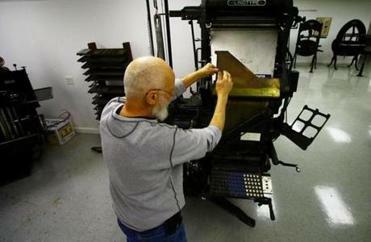 Unlike many institutions, he said, the Museum of Printing has no endowment. “We buy nothing,” he explained. The MoP, as it’s informally known, generates much of its income through membership in its Friends group (typically $40 annually, with about 500 members). Additional revenue streams include admission charges and sales in the gift shop, which offers books, prints, T-shirts, and old tabletop presses and supplies. 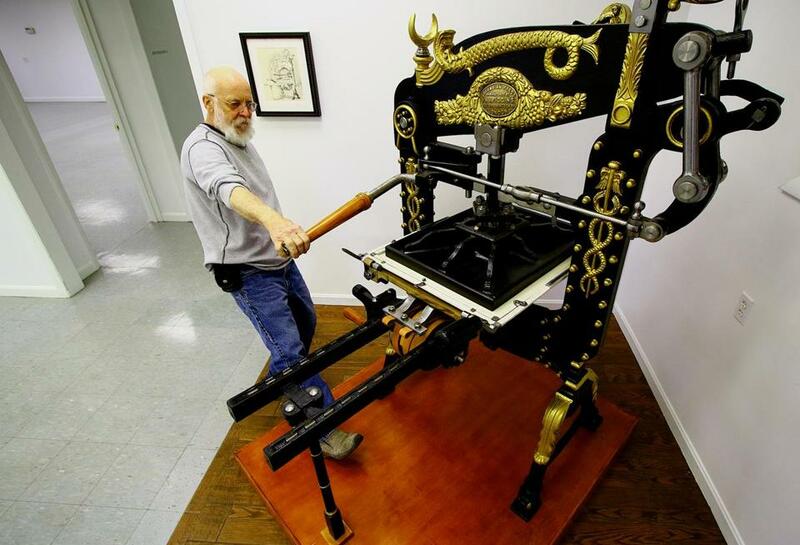 There’s been a resurgence of interest in traditional printing, said Lance Hidy, an acclaimed graphic designer and poster artist who helped launch Godine Press in Boston around 1970. His work is on display in the museum gallery, alongside the woodcut prints of the late Mark T. Fowler and 95-year-old Anna Hogan of North Andover. For Hidy, who teaches photography and graphic design at Northern Essex Community College, the key to the museum’s ongoing viability will be its commitment to education. For all Romano’s vast knowledge of printing, it wasn’t exactly his chosen field. Upon college graduation, he was offered two jobs: one in the pharmaceutical world and the other with Mergenthaler Linotype, the company that introduced a new method of “hot metal” typesetting in the 1880s. He went on to work with a succession of startups, including Compugraphic and, later, Apple. (The museum has a comprehensive collection of Apple’s early desktop computers, sent to Romano by Steve Jobs.) When Rupert Murdoch bought the New York Post in the mid-1970s, he hired Romano to analyze the paper’s printing plant. Romano told the mogul he needed to invest in color presses. Along the way, Romano stockpiled everything he could find related to the world of print. “I still have an unbelievable sense of wonder about it all,” he said. One of the museum’s centerpieces is its rare Columbian press, a massive machine with a looming iron eagle, which acts as the counterweight. It was recently obtained in a trade with a collector in Toronto, and its elaborate design and gold accents are “like jewelry,” Leigh said. Designers who remain interested in such antiquated mechanics tend to fall into two categories, said Hidy: those resistant to the digital era, and those who may be leaders in the digital world, but appreciate the craftsmanship of the older technologies. The Museum of Printing, at 15 Thornton Ave. in Haverhill, is open every Saturday from 10 a.m. to 4 pm. Admission is $8 for adults and $5 for children, students, and seniors. For more, go to www.museumofprinting.org. 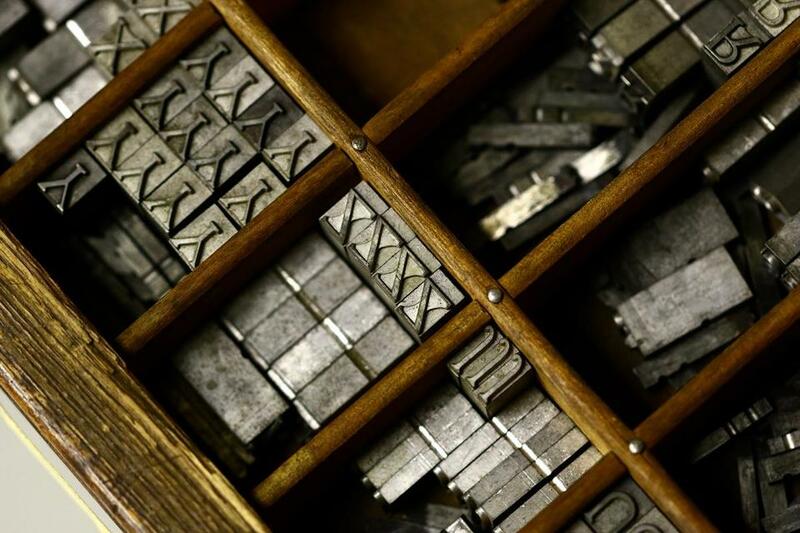 A drawer of letters used in printing called movable type, which originated with Johannes Gutenberg in Germany in the 1400s.